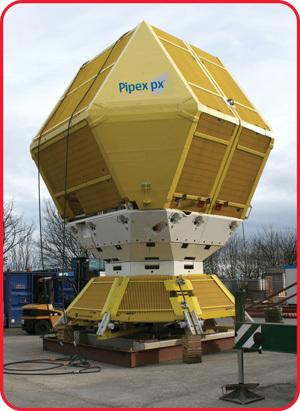 Cocoon and Shroud® subsea protection systems are designed and manufactured by UK-based Composite Solutions, a Pipex px® company. The systems are designed to protect subsea oilfield flowbases from the marine environment, objects dropped during drilling, or fishing trawler net incidences. Both the Cocoon and Shroud® use Strongwell components including 8″ (203mm) EXTREN DWB® (all glass), EXTREN® series 625 profiles and plate, and DURADEK® I-6000 1-1/2″ (38mm) grating. The Cocoon utilizes a unique skeletal “clam” design with an external surface using lightweight FRP (fiberglass reinforced polymer) materials, ensuring that fishing gear is either safely deflected or easily retrieved. The Shroud element located at the base of the Cocoon allows simple offshore deployment and installation to well heads. The first Cocoon was installed ten years ago and now, there are over 23 in the North Sea. It was an easy decision to use Strongwell materials due to the weight reduction, corrosion resistance, and ability to withstand impact. Strongwell's vinyl ester products were chosen for enhanced performance in harsh subsea conditions (100m/650 ft. depth+).